I absolutely adore calling cards, and I've been meaning to write an article about them for the past several months. The Art of Manliness has beaten me to it, and I see no need to spend ages writing an article that has already been written so well. You really MUST go read it! I will add a few words about modern applications of the calling card and some resources for those out there interested in stocking up on calling cards. Why Should I have a Calling Card? College: Calling cards in college serve two purposes: making friends and impressing employers (also see dating). Think of a calling card as a less pretentious business card, which allows you to network with potential summer employers, professors and recruiters at job fairs. Handing a recruiter a calling card PLUS a resume makes it twice as likely that they will remember who you are after meeting hundreds of eager students. Calling cards are also useful for keeping in touch with suite mates over the summer and helping that cute boy from chemistry remember your name long enough to "friend" you on facebook. Old fashioned social networking: Not all networking happens online. Human interaction is not to be underestimated in its ability to find new readers for your blog or land your next job. 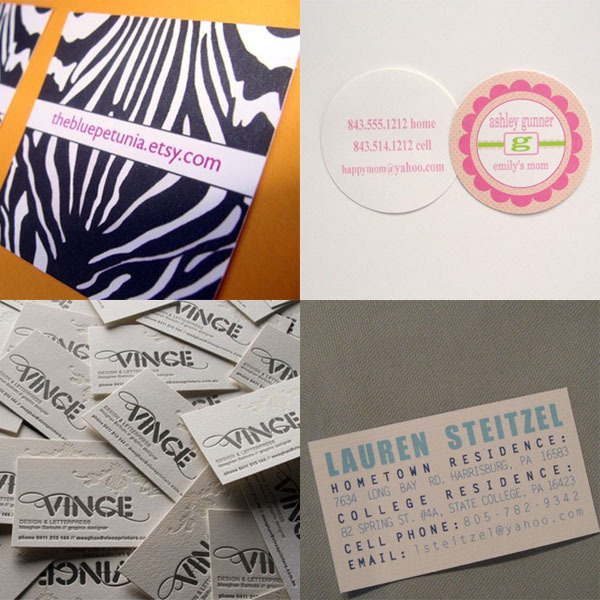 Handing out a calling card is especially preferable when looking for a new job. Do you really want to only give a future employer your contact information at your current job--because that is the only information on your business card. Handing out calling cards when networking also helps form relationships with contacts that transcend the work place, making it easier to keep your contacts when you change jobs because contacts have your gmail address, in addition to your former work address. Dating: Do you want to be remembered as Sally Smith the Pharmaceutical Sales Rep? How about as a nameless phone number scribbled hastily on a bar napkin (Hello...is this Sarah, oops, I mean Sally)? No, no...you would much prefer to have gentlemen callers who call you at home (not at work) and remember your name. Child Rearing: Play dates, carpools, moon walk birthday parties...after having children your social landscape will change forever. Coordinating the many activities of your offspring should probably not go through your office secretary if you are working mother, so you don't really want to hand out your work number or office email address to coordinate that paint ball trip this weekend. On the other hand, you might be a stay at home mother, in which case you still need a quick means of exchanging contact information with Brian's new best friend's mother from the playground. I also find cards which include your child's name to be helpful to all parties involved. Where can I buy a Calling Card? Celia Chen: Notes on a Party: Here's My Card, Call Me! I love this. I really do. I actually have some bloggy cards. My blog designer made a design for me with my blog, email and name for BlogHer. They are useful when I meet people or stop in a shop or restaurant and tell them I plan on writing about them. I'd love to get some regular (non-blog) ones made up too eventually! I have been undecided about calling cards for a while- so glad you investigated some of the pros! I love this idea.. thanks for the post! these are lovely. you should definitely check out mini mooo cards, they're are absolutely spendid!!! Everyone should carrying calling cards! I give out at least 3 a day! Best to have ones that are interesting and people will want to keep them! Good luck with Digg... I love tuning into all your fashionistas!